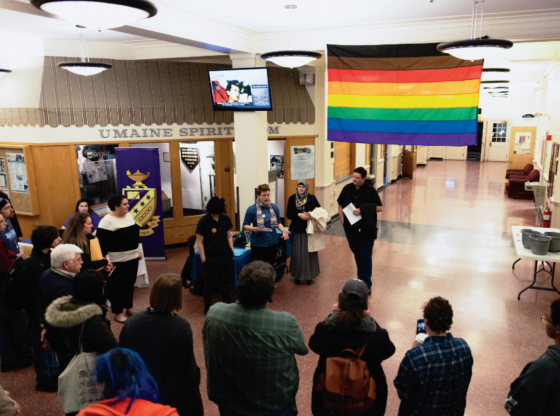 On Friday, Feb. 8 the University of Maine Black Student Union (BSU) held a social in the Office of Multicultural Student Life in the Memorial Union. This is one of the first events hosted by the BSU as part of Black History Month, which takes place during the month of February. The Black History Month Friday socials will be a recurring event every Friday throughout February. They offer an opportunity for community members to learn more about this student organization, its campus initiatives and political activism. Mason Martin, a third-year marine biology student and assistant associate for the Office of Multicultural Student Life, attended the event. The Office of Multicultural Student Life is one of the groups that partners with the BSU. The BSU is also partnering with Student Life, the Women’s Resource Center and the Feminist Collective. February is a busy month with more than 22 events scheduled in 28 days. BSU President Taylor Bass said that, despite the large workload, she is excited. “We want to be building relationships and breaking barriers for people who normally wouldn’t be interacting with each other,” Bass said. One way the BSU is breaking these barriers and introducing people is over food. Many of the BSU’s events offer free food to anyone who attends, and for their first social this month they served up Chinese food. Martin believes that these socials are a great way for new students to find a community. “Socials here break the ice, they give you networking,” Martin said. “[Our goal is to] create allies and make it a good space and a good month for not only people of color but white people and just unite people,” Bass said. The BSU currently has around 15 active members, and Bass said they are always looking for more. The next social event will be held on Feb. 15 in the Office of Multicultural Student Life.